​Soprano singer Laura Wright has today joined SportsAid’s growing list of celebrity supporters to encourage more people to support the next generation of British athletes. Some of Britain's top Olympic and Paralympic athletes will be at SportsAid's SportsBall in London on November 27 to help talented new-comers hoping to follow in their footsteps. 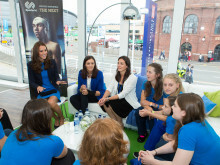 Laura Robson will support some of Great Britain's most promising young female athletes as a new SportsAid ambassador. The role officially begins tomorrow in Glasgow where she will lead a special mentoring session for aspiring sports women alongside fellow Olympian Keri-anne Payne.